Swarms of students, Lynchburg residents and hungry media personnel gathered to listen to business billionaire Donald Trump speak on success and politics at Liberty University Monday, Sept. 24. 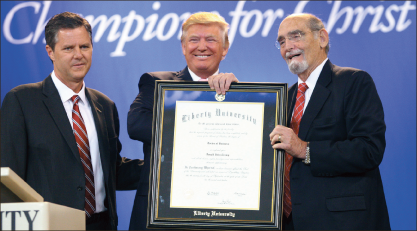 Trump, who received an honorary doctoral degree in business from Liberty, expressed his fear about where the country was heading under the Obama administration. Previously entertaining the idea of running for president, Trump began to support presidential candidate Mitt Romney after he dropped out of the race. Students who attended convocation expressed how transparent Trump was with his political views throughout his address. Primarily, Trump believes that the nation needs to reassess its standards before it can move forward. Lightening the gloomy mood of politics, Trump switched gears half-way through his speech and spoke about how to become a successful person in life. “You have to have an ability to handle pressure. People (who) can handle pressure can be entrepreneurs, can be successful,” Trump said. Joining Trump for added support were winners of the Miss Universe and Miss USA pageants, who happened to be in town at the time. They believe that Trump is not only one of the most successful people to work for, but also one of the best. Students felt that his advice on business and success was well put. According to Trump, the most important thing one can take into consideration when planning for a career is whether one is passionate for that field of study. After convocation, Trump complimented the university on what it has done in such a short amount of time.